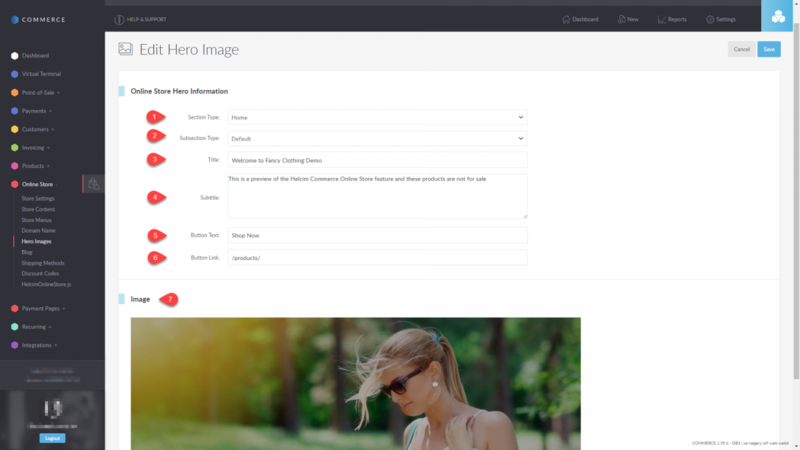 A hero image is a large picture that is stretched across the top of the page like a banner (you can see an example of this at https://www.fancy-clothing.com/). These can be added to any page purely for visual purposes and are not necessary for online store function. Section Type: Choose where you would like this hero image to display. Please note that you can have as many hero images as you’d like on the same page, they will simply rotate every 10 seconds. Subsection Type: If the section type has subsections, choose which subsection you want the image to display on. For example, if you choose “Category” as the Section Type, then you can choose one of the available categories as subsection type. Title: This is what will show in bigger font across the hero image. You can leave it blank if preferable. Subtitle: This will show under the title in smaller font. You can also it blank if preferable. Button Text: If you’d like to add a button that will redirect to a certain page, add the text the button will display here. This can be any of the pages listed in the header or footer of the store. Press Save in the upper right corner once the above has been filled out. You can now add the image that will display by clicking on the No Image button that appears and choosing from either the previously uploaded images or a new upload. You can see how each point will look in the store in the screenshot with corresponding numbers below.